Kuju (くじゅう) area is located south-west area of Oita Prefecture. Kuju Mountain as the center, there are many beautiful mountains and nature spots in this area. 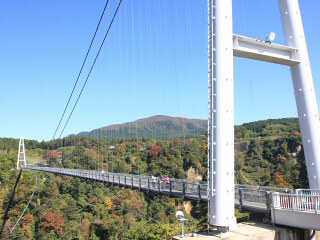 Kuju Mountain is one of the most popular mountain in western Japan. Like other cities of Oita, this area has many Onsen as well. Harajiri Falls is one of the best waterfalls in Japan It is considered as the Asian Niagara Falls. Use Kyusyu Express Way to south. Change Oita Express Way. Exit at Kuju. Use Kyusyu Shinkansen to Kurume Station. Change to JR Kyudai Line to Bungo-Nakamura Station.